I hit the thrift store today. 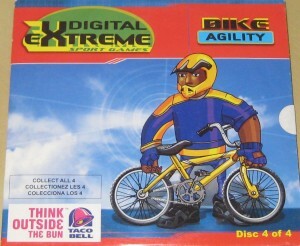 I found this specimen– Digital Extreme Sport Games: Bike Agility. You’ll notice that it’s disc 4 of 4 in a Taco Bell promotion. It was created by Maxx Marketing in 2005 (according to the copy on the back). This is the same group that would, in the following year, create the Taco Bell Tek Kids series of games, extensively documented on this very blog. The fact that there are 4 of these discs and I only have one creates an irrational drive for me to complete the set. For the record, the box copy also lists a technical support hotline in operation between July 29 and September 15, 2005, implying that that’s when this promotion ran. Sometimes I think that it might be a bit silly for me to endeavor to document these video games. Not because it constitutes ephemeral pablum of a pop consumer culture; that’s a debate for a different forum. But I sometimes get the impression that with so many people on the internet blogging and tweeting and facebooking and what have you, that a bunch of stuff like this will be passively documented and archived by default. Yet, I can’t find any trace of this game when I google for variations of the name (except for a copy from some Amazon seller). Indeed, googling for the Tek Kids series mostly yields results either from this blog, or from MobyGames (data submitted entirely by me), or data cribbed from one of those 2 sources. So I guess I’m doing some good (for fairly loose definitions of ‘good’) by trying to document this junk. 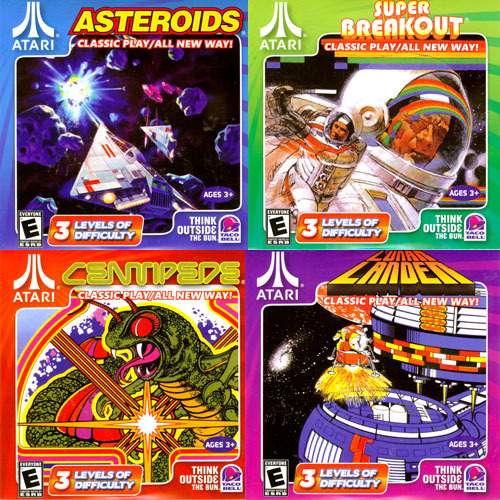 This is a promotion with Atari in which 4 classic Atari games– Asteroids, Breakout, Centipede, and Lunar Lander. Each cover states “The legend is back by popular demand!” I’m assuming this is a reference to the fact that they ran this same promotion 2 years ago, in the spring of 2010. 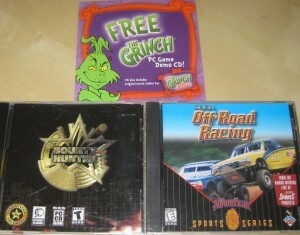 I picked up the full set of CD-ROMs then as well, though I wouldn’t begin this acquisition log until a year later. 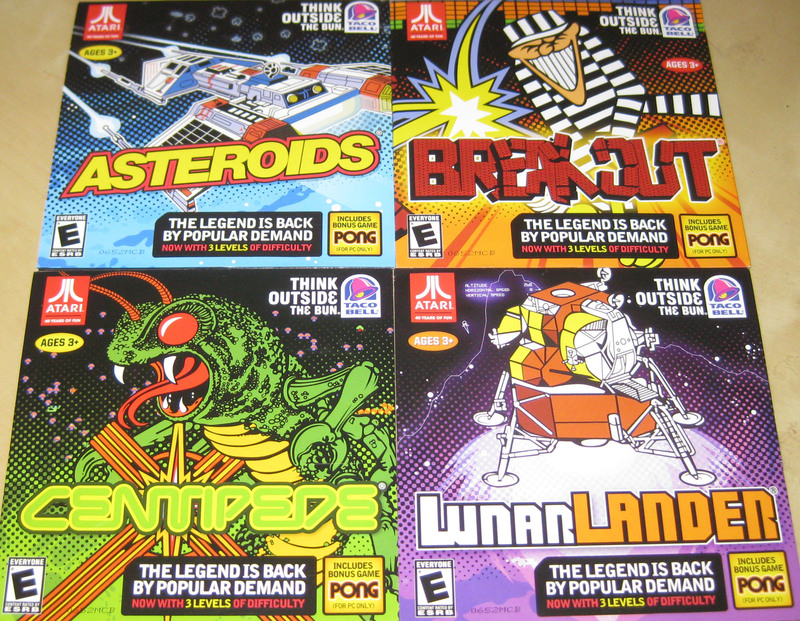 Actually, now that I post those cover art scans, I recognize another difference: Super Breakout vs. Breakout. I tend to doubt the difference between the 2 games is especially significant. It looks like I already did most of the documentation work for those Atari games 2 years ago. I see that I already have cover art scans and screenshot sets for all 4. I guess I just needed to do the MobyGames write-up and tweak it 4 times, and make a post for this blog. I must have gotten too busy. But I hope to get back to looking at these games soon since I’m eager to see if these are exactly the same as the games from 2 years ago. The 2010 games were interesting technically in that they were developed using Adobe AIR technology (which I had a hand in at the time). I remember these not being a very, eh… performant showcase of the technology. However, a bonus, unadvertised feature was that they were able to run on Linux due to the (now discontinued) Linux support for AIR. The full title of the series is X-Games Xperience, and the corporate logos involved include Taco Bell, ESPN, and ESPN2. There are 3 games: BMX, Inline Skating, and Moto X. However, there is a fourth unlockable game– Skateboarding. I know because it looks like I had the screenshot sets all ready to go for this series as well (I must have been planning to write this one up at the same time as the previous set). Ah, the memories. At least knowledge that these titles ever existed should be available, should anyone query the googles on the matter. Bounty Hunter, which (based on the back cover screenshots) appears to be a Global Star rebranding of BHunter, which finally expands the title out to what people assume is the full name anyway. I was just playing the Taco Bell Moto X game. I got it when I was a kid and found it today. Thanks for the info. I am going to keep looking for more info about this. 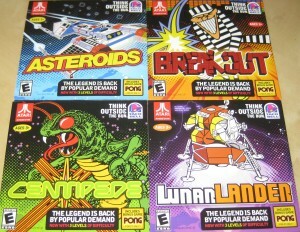 What do you mean you had a hand in the Atari Taco Bell games? I programmed those as part of Legacy. @Martin: Sorry for the confusion– I didn’t help program these games. At the time, I worked on the Flash Player for Adobe, which is related to the Adobe AIR technology, which I found the games to be based upon.